Bee pollen rejuvenates the body, stimulates organs and glands, enhances vitality, and brings about a longer life span. Often referred to as nature’s perfect food. With 96 known nutrients, Bee Pollen is a rich dietary source of zinc, calcium, magnesium and iron. It can energize your pet, well giving them a sense of well being, increase their intellectual capacity and most importantly close any nutritional gaps in their diet. Bee pollen contains all the essential components of life. Bee pollen corrects the deficient or unbalanced nutrition, common with most commercial pet foods. Honeybee pollen and raw honey are the only food on earth containing all 22 nutrients needed by mankind for complete and perfect health. Come get one for your pets. I am very happy with this product. It is easy to give to the cats, I mix a little in their wet food and they eat it up! Bee Polllen is very good for cats and this is such an easy way to give it to them! 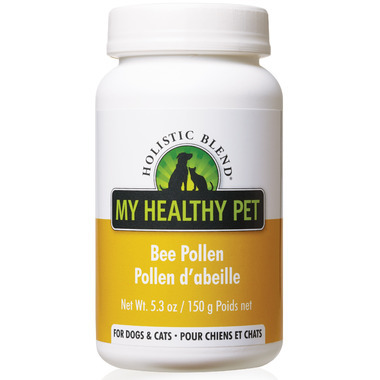 Bee pollen is a wonderful supplement for your furry friend. I subtracted one star because my dogs hate the taste (and they'll eat ANYTHING) so I have to puree it in their fruits and veggies.